In a news conference in Jordan, Ban said he was « encouraged » that the UNESCO world heritage site is out of extremist hands and that the Syrian government « is now able to preserve and protect this human common cultural asset ». What followed was the roll up of all « rebels » that posed an immediate danger to the Syrian government. After Turkey ambushed a Russian jet all « rebel » forces supported by Turkey became priority targets. When the success of large scale offensives in Latakia and around Aleppo was established, Russia imposed a cease fire on the U.S. supported forces and on the Syria government. 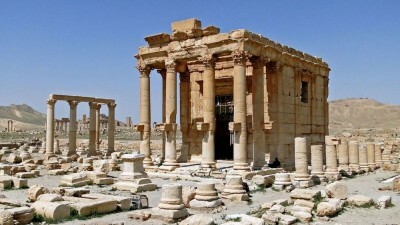 This cease fire freed up the Syrian, Iranian and Russian forces needed to successfully take back Palmyra. From there on the attack will progress eastward to Deir Ezzor and later on to Raqqa.